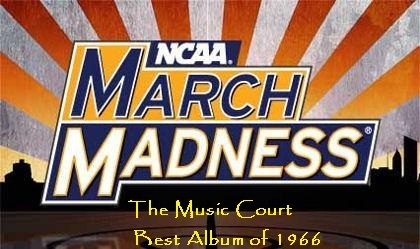 The Music Court’s March Madness Is Back! Last year, The Music Court celebrated the College Basketball March Madness tournament by forming its own unique March Madness-themed poll that had nothing to do with college basketball. Instead, we set 16 albums against each other (all released in 1967) in a battle of superiority. How did it work? The poll idea was mainly an experiment. In order for something like this to work, I need help from all of you. The response was good enough to keep this March Madness poll annual. And, as you can see by the picture above, we are traveling back in time one year (from 1967) and reproducing the idea. The Beatles may have taken the title of best album of 1967, but what artist released the best album in 1966. Was it still the Beatles with Revolver? Starting a little under a month from now, I will post up the initial match-ups and urge you to vote. I hope that we can produce an equally awesome performance and I am looking forward to getting the show on the road. I compiled the list today, and, although we are not starting with the first match-up right now, I do have something related to share with you all. Oh, if you are confused about all of this March Madness mumbo-jumbo and need a good description, do not worry, I will provide one in the first poll post soon. When I was compiling the list of albums earlier today, I initially listed 19 albums. I needed to get the number down to an even 16, and after some inner deliberation, trimmed the fat, so to speak. The 17-19 best albums of 1966 may have just missed our list, but they are still excellent albums that deserve recognition. If you have been reading the Obscure Classic Rock section, you can appreciate how difficult it was to succeed in music during the mid-60s because of the high level of talent and competition. Sitting at #17 are The Fugs and their self-titled second release. This folk/psychedelic act named after Norman Mailer’s euphemism for a certain four-letter word that begins with F in “The Naked and the Dead”, featured Beat/Hippie crossovers Ed Sanders and Ken Weaver, and Beat poet Tuli Kupferberg. The songs certainly reflected the burgeoning 60s hippie counterculture, and their satirical protest songs are humorous, poignant and original. This particular album has my favorite Fugs song, “Kill for Peace,” a clear contradiction and Kupferberg composition. It is a ditty that inspired future artists like Country Joe. You can definitely hear some punk roots growing here! Absolutely, Nicole. I believe The Fugs was one of the grandfathers of punk. Interesting how punk indirectly grew out of the beat generation, which totally makes sense I feel.